covenant be illustrated by an Old-Testament place of worship? Chosen men were especially endowed by God with skill and wisdom for the construction of the sacred building. God Himself gave to Moses the plan of that structure, with particular directions as to its size and form, the materials to be employed, and every article of furniture which it was to contain. The holy places made with hands were to be "figures of the true," patterns of things in the heavens" (Hebrews 9:24, 23)—a miniature representation of the heavenly temple where Christ, our great High Priest, after offering His life as a sacrifice, was to minister in the sinner's behalf. God presented before Moses in the mount a view of the heavenly sanctuary, and commanded him to make all things according to the pattern shown him. All these directions were carefully recorded by Moses, who communicated them to the leaders of the people. While the building of the sanctuary was in progress the people, old and young—men, women, and children—continued to bring their offerings, until those in charge of the work found that they had enough, and even more than could be used. And Moses caused to be proclaimed throughout the camp, "Let neither man nor woman make any more work for the offering of the sanctuary. So the people were restrained from bringing." The murmurings of the Israelites and the visitations of God's judgments because of their sins are recorded as a warning to after-generations. And their devotion, their zeal and liberality, are an example worthy of imitation. All who love the worship of God and prize the blessing of His sacred presence will manifest the same spirit of sacrifice in preparing a house where He may meet with them. They will desire to bring to the Lord an offering of the very best that they possess. A house built for God should not be left in debt, for He is thereby dishonored. An amount sufficient to accomplish the work should be freely given, that the workmen [p. 347] may be able to say, as did the builders of the tabernacle, "Bring no more offerings." The sacred tent was enclosed in an open space called the court, which was surrounded by hangings, or screens, of fine linen, suspended from pillars of brass. The entrance to this enclosure was at the eastern end. It was closed by curtains of costly material and beautiful workmanship, though inferior to those of the sanctuary. The hangings of the court being only about half as high as the walls of the tabernacle, the building could be plainly seen by the people without. In the court, and nearest the entrance, stood the brazen altar of burnt offering. Upon this altar were consumed all the sacrifices made by fire unto the Lord, and its horns were sprinkled with the atoning blood. Between the altar and the door of the tabernacle was the laver, which was also of brass, made from the mirrors that had been the freewill offering of the women of Israel. At the laver the priests were to wash their hands and their feet whenever [p. 348] they went into the sacred apartments, or approached the altar to offer a burnt offering unto the Lord. The cover of the sacred chest was called the mercy seat. This was wrought of one solid piece of gold, and was surmounted by golden cherubim, one standing on each end. One wing of each angel was stretched forth on high, while the other was folded over the body (see Ezekiel 1:11) in token of reverence and humility. The position of the cherubim, with their faces turned [p. 349] toward each other, and looking reverently downward toward the ark, represented the reverence with which the heavenly host regard the law of God and their interest in the plan of redemption. No language can describe the glory of the scene presented within the sanctuary—the gold-plated walls reflecting the light from the golden candlestick, the brilliant hues of the richly embroidered curtains with their shining angels, the table, and the altar of incense, glittering with gold; beyond the second veil the sacred ark, with its mystic cherubim, and above it the holy Shekinah, the visible manifestation of Jehovah's presence; all but a dim reflection of the glories of the temple of God in heaven, the great center of the work for man's redemption. A period of about half a year was occupied in the building of the tabernacle. When it was completed, Moses examined all the work of the builders, comparing it with the pattern shown him in the mount and the directions he had received from God. "As the Lord had commanded, even so had they done it: and Moses blessed them." With eager interest the multitudes of Israel crowded around to look upon the sacred structure. While they were contemplating the scene with reverent satisfaction, the pillar of cloud floated over the sanctuary and, descending, enveloped it. "And the glory of the Lord filled the tabernacle." There was a revealing of the divine majesty, and for a time even Moses could [p. 350] not enter. With deep emotion the people beheld the token that the work of their hands was accepted. There were no loud demonstrations of rejoicing. A solemn awe rested upon all. But the gladness of their hearts welled up in tears of joy, and they murmured low, earnest words of gratitude that God had condescended to abide with them. The garments of the high priest were of costly material and beautiful workmanship, befitting his exalted station. In addition [p. 351] to the linen dress of the common priest, he wore a robe of blue, also woven in one piece. Around the skirt it was ornamented with golden bells, and pomegranates of blue, purple, and scarlet. Outside of this was the ephod, a shorter garment of gold, blue, purple, scarlet, and white. It was confined by a girdle of the same colors, beautifully wrought. The ephod was sleeveless, and on its gold-embroidered shoulder pieces were set two onyx stones, bearing the names of the twelve tribes of Israel. Not only the sanctuary itself, but the ministration of the [p. 352] priests, was to "serve unto the example and shadow of heavenly things." Hebrews 8:5. Thus it was of great importance; and the Lord, through Moses, gave the most definite and explicit instruction concerning every point of this typical service. The ministration of the sanctuary consisted of two divisions, a daily and a yearly service. The daily service was performed at the altar of burnt offering in the court of the tabernacle and in the holy place; while the yearly service was in the most holy. Every morning and evening a lamb of a year old was burned upon the altar, with its appropriate meat offering, thus symbolizing the daily consecration of the nation to Jehovah, and their constant dependence upon the atoning blood of Christ. God expressly directed that every offering presented for the service of the sanctuary should be "without blemish." Exodus 12:5. The priests were to examine all animals brought as a sacrifice, and were to reject every one in which a defect was discovered. Only an offering "without blemish" could be a symbol of His perfect purity who was to offer Himself as "a lamb without blemish and without spot." 1 Peter 1:19. The apostle Paul points to these sacrifices as an illustration of what the followers of Christ are to become. He says, "I beseech you therefore, brethren, by the mercies of God, that ye present your bodies a living sacrifice, holy, acceptable unto God, which is your reasonable service." Romans 12:1. We are to give ourselves to the service of God, and we should seek to make the offering as nearly perfect as possible. God will not be pleased with anything [p. 353] less than the best we can offer. Those who love Him with all the heart, will desire to give Him the best service of the life, and they will be constantly seeking to bring every power of their being into harmony with the laws that will promote their ability to do His will. The incense, ascending with the prayers of Israel, represents the merits and intercession of Christ, His perfect righteousness, which through faith is imputed to His people, and which can alone make the worship of sinful beings acceptable to God. Before the veil of the most holy place was an altar of perpetual intercession, before the holy, an altar of continual atonement. By blood and by incense God was to be approached—symbols pointing to the great Mediator, through whom sinners may approach Jehovah, and through whom alone mercy and salvation can be granted to the repentant, believing soul. As the priests morning and evening entered the holy place at the time of incense, the daily sacrifice was ready to be offered upon the altar in the court without. This was a time of intense interest to the worshipers who assembled at the tabernacle. Before entering into the presence of God through the ministration of the priest, they were to engage in earnest searching of heart and confession of sin. They united in silent prayer, with their faces toward the holy place. Thus their petitions ascended with the cloud of incense, while faith laid hold upon the merits of the promised Saviour prefigured by the atoning sacrifice. The hours appointed for the morning and the evening sacrifice [p. 354] were regarded as sacred, and they came to be observed as the set time for worship throughout the Jewish nation. And when in later times the Jews were scattered as captives in distant lands, they still at the appointed hour turned their faces toward Jerusalem and offered up their petitions to the God of Israel. In this custom Christians have an example for morning and evening prayer. While God condemns a mere round of ceremonies, without the spirit of worship, He looks with great pleasure upon those who love Him, bowing morning and evening to seek pardon for sins committed and to present their requests for needed blessings. The most important part of the daily ministration was the service performed in behalf of individuals. The repentant sinner brought his offering to the door of the tabernacle, and, placing his hand upon the victim's head, confessed his sins, thus in figure transferring them from himself to the innocent sacrifice. By his own hand the animal was then slain, and the blood was carried by the priest into the holy place and sprinkled before the veil, behind which was the ark containing the law that the sinner had transgressed. By this ceremony the sin was, through the blood, transferred in figure to the sanctuary. In some cases the blood was not taken into the holy place; [* See Appendix, Note 6.] but the flesh was then to be eaten by the priest, as Moses directed the sons of Aaron, saying, "God hath given it you to bear the iniquity of the congregation." [p. 355] Leviticus 10:17. Both ceremonies alike symbolized the transfer of the sin from the penitent to the sanctuary. Important truths concerning the atonement were taught the people by this yearly service. In the sin offerings presented during the year, a substituted had been accepted in the sinner's stead; but the blood of the victim had not made full atonement for the sin. It had only provided a means by which the sin was [p. 356] transferred to the sanctuary. By the offering of blood, the sinner acknowledged the authority of the law, confessed the guilt of his transgression, and expressed his faith in Him who was to take away the sin of the world; but he was not entirely released from the condemnation of the law. On the Day of Atonement the high priest, having taken an offering for the congregation, went into the most holy place with the blood and sprinkled it upon the mercy seat, above the tables of the law. Thus the claims of the law, which demanded the life of the sinner, were satisfied. Then in his character of mediator the priest took the sins upon himself, and, leaving the sanctuary, he bore with him the burden of Israel's guilt. At the door of the tabernacle he laid his hands upon the head of the scapegoat and confessed over him "all the iniquities of the children of Israel, and all their transgressions in all their sins, putting them upon the head of the goat." And as the goat bearing these sins was sent away, they were, with him, regarded as forever separated from the people. Such was the service performed "unto the example and shadow of heavenly things." Hebrews 8:5. 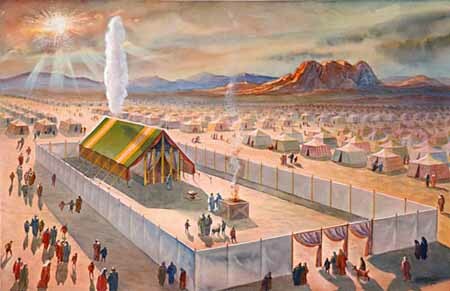 The heavenly temple, the abiding place of the King of kings, where "thousand thousands ministered unto Him, and ten thousand times ten thousand stood before Him" (Daniel 7:10), that temple filled with the glory of the eternal throne, where seraphim, its shining guardians, veil their faces in adoration—no earthly structure could represent its vastness and its glory. Yet important truths concerning the heavenly sanctuary and the great work there carried forward for man's redemption were to be taught by the earthly sanctuary and its services. In the great day of final award, the dead are to be "judged out of those things which were written in the books, according to their works." Revelation 20:12. Then by virtue of the atoning blood of Christ, the sins of all the truly penitent will be blotted from the books of heaven. Thus the sanctuary will be freed, or [p. 358] cleansed, from the record of sin. In the type, this great work of atonement, or blotting out of sins, was represented by the services of the Day of Atonement—the cleansing of the earthly sanctuary, which was accomplished by the removal, by virtue of the blood of the sin offering, of the sins by which it had been polluted. Click here to read the next chapter: "The Sin of Nadab and Abihu"